just considering it, you need to see my shocking findings. getting ALL or NONE of turmeric’s proven health benefits. Hello, my name is Dr. Al Sears. If you’ve read my newsletter Doctor’s House Call or any of my work, you know I’ve touted the healing benefits of turmeric — and specifically its active ingredient curcumin — for years. Long before it became a fad, I’ve talked about how it’s more powerful than Big Pharma’s synthetic chemicals… without the side effects. Here at the Sears Institute for Anti-Aging Medicine, we do NOT use typical turmeric supplements. It’s very difficult for our bodies to absorb. And they do NOT cross your blood-brain barrier. The sad truth: most turmeric users only get LESS THAN 5% of its true healing potential. Isn’t it outrageous that even with the mountain of scientific research proving its benefits… we still lack access to a TRUE source of something so powerful — and so proven — as turmeric? Adding similar roots and herbs that synergistically work with turmeric. A special “delivery system” that transforms turmeric from a kitchen spice into the world’s most powerful healer. I traveled the world to find three natural roots with outstanding health benefits. And in just a moment, you’ll see why this is several generations ahead of conventional turmeric. How my patients are already seeing benefits you can’t get with most turmeric supplements. 3 other natural roots I added that are proven to AMPLIFY turmeric’s strength. And how you too can begin to experience the TRUE potential of turmeric, for the first time ever. I’ll reveal all of this, and more, in just a moment. In fact, it delivers no less than 619 ESSENTIAL BENEFITS for just about everything you can imagine. These are the sort of life-changing results my patients and I are now used to seeing all of the time. But it’s only possible IF the turmeric is actually absorbable… and IF it crosses the blood-brain barrier. Which is why I’ve added a new technology that’s proven to achieve both those things. And within 45 minutes of use, patients saw a stunning 2,000% increase in curcumin levels. Not only that, it lasted longer in the bloodstream. Now research is confirming that it actually WORKS better, too. 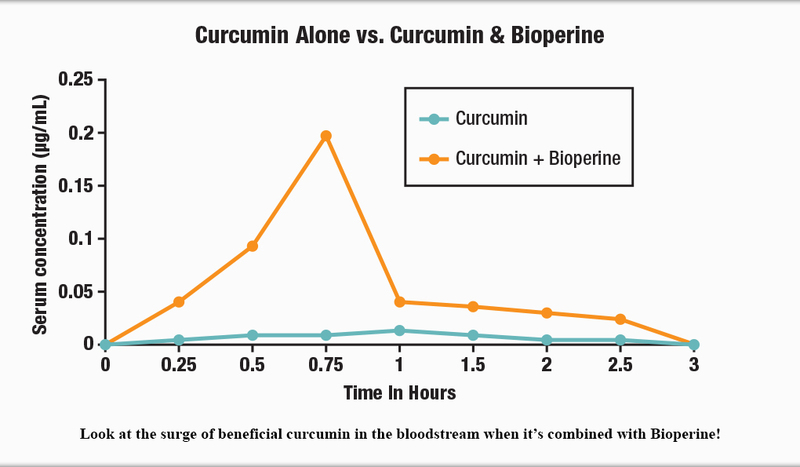 In over four weeks, the group that received curcumin and piperine saw NO changes to their blood levels. In other words, the effects of a high-fat diet on their cholesterol and triglyceride levels were negligible. In fact, their HDL (“good”) cholesterol levels actually increased! That’s what curcumin is SUPPOSED to do. And piperine helps it get those results. They found that the curcumin/piperine significantly boosted the subject’s dopamine and serotonin levels, which are essential to mood and happiness. One month later, they analyzed the glucose levels and saw better results in the curcumin/piperine group compared to the other groups! All of which are shown to wreak havoc your health. 2’000% boost when curcumin and piperine are combined! You don’t enjoy results like these unless you have a proven delivery system for turmeric. That’s why I refused to make a curcumin formula without including one, like so many supplement makers have. But I took it a step further. Two steps further, to be exact. I’ve added two spices that belong to the curcumin “family”. They’re both members of the elite group of rhizomes (root-like underground stems). They’re both staples of ancient Ayurvedic medicine that go back over 4,000 years, just like curcumin. And they both have similar proven benefits as curcumin, and act on age-related inflammation in a similar way. 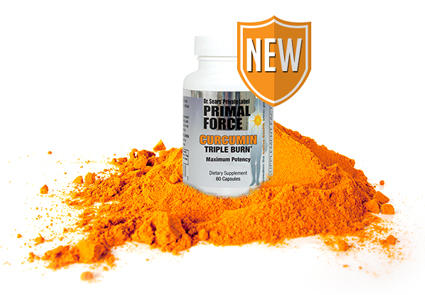 So when all three are added together, they not only complement, but magnify curcumin’s results. 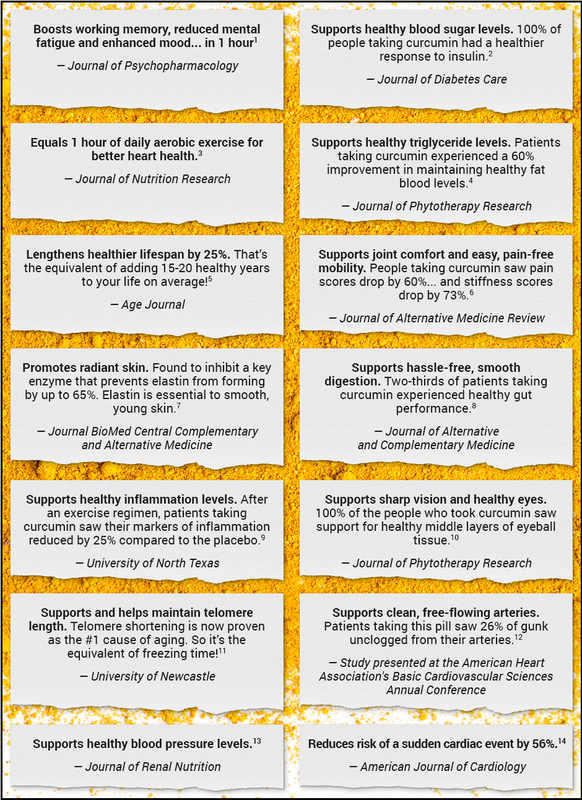 These are just a few reasons why I’ve made them key to my new formula: Curcumin Triple Burn. The first is perhaps the world’s oldest medicinal spice, used going back 5,000 years at least. It was first grown in Ancient China and India, where it was touted as a gift from God. Then it spread all around the world as a luxury and powerful form of medicine. In fact, ancient texts going back to the earliest Sanskrit literature praise it as an all-purpose healer. So do medicinal books in ancient Rome, Greece and the Middle East. Most of the prescriptions written in Chinese traditional medicine included a combination of herbs. And this one was in over half of them! Explorer Marco Polo thoroughly documented its cultivation and use in his expedition to East Asia. The Roman Empire considered it a luxury reserved for the rich. And it was very expensive: one pound of this spice was equivalent to a whole sheep or cow. I’m talking about ginger, of course. But not the kind in your spice cabinet, cookies or soda. Nor just any plain ol’ ginger supplement. Instead, I recommend a concentrated dose of its most powerful medicinal compound: gingerol. Just like curcumin is the molecular “hero” in turmeric, so too is gingerol the powerhouse inside ginger. You see, ginger “switches off” the genes that cause age-related inflammation — much like curcumin. The most powerful of these is the molecule Nuclear Factor-kappa beta (NF-kB) — the body’s inflammation command center. NF-kB is the “switch” that activates over 400 of our body's pro-inflammatory genes. Including the enzymes COX-2, iNOS and LOX. As a result it provides our body the blueprint for regulating its inflammatory response. Because nature already designed at least two powerful NF-kB deactivators: curcumin and ginger. In combination they’re a powerful duo against the leading cause of age-related inflammation. That’s also why studies point to ginger as such a powerful joint remedy. One double-blind study treated 120 joint patients with either a placebo or gingerol. In just 12 weeks, the ginger group saw remarkably healthy inflammation markers. The result: its joint-relief benefits are second to none. In a double-blind study, they compared gingerol extract to a placebo in 261 knee joint patients. They found the ginger supported healthy joint comfort by 40% over the placebo… in just six weeks. 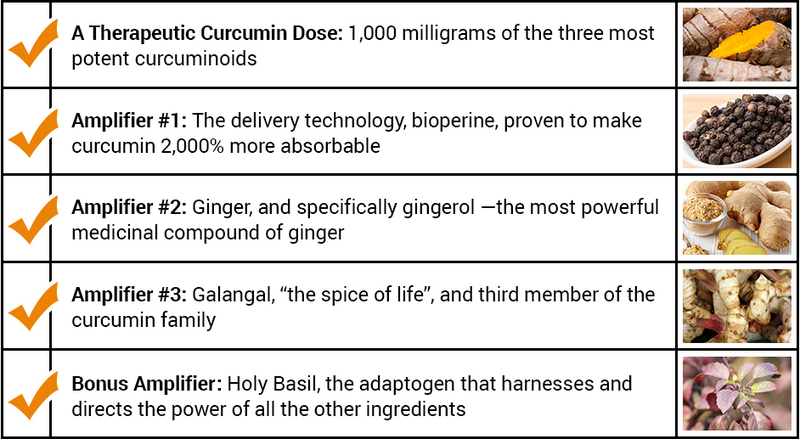 What makes ginger so powerful? Most joint solutions simply block the formation of certain inflammatory compounds. But also has antioxidant effects that break down existing inflammation and acidity in the fluid within the joints. That’s why the researchers concluded its work superior to popular joint treatments. “Ginger has anti-inflammatory… and antioxidant activities, as well as a small amount of [pain relieving] property,” says Roberta Lee, MD, vice chair of the Department of Integrative Medicine at Mount Sinai Beth Israel. But ginger didn’t deliver these results alone. In fact, there was another spice used in the study that went overlooked. It’s the third member of the elite group of rhizome plants. In combination with ginger, the research shows it works wonders on a variety of health concerns. Like curcumin and ginger, it has a 4,000-year history of use in ancient medicine systems. So it was a no-brainer as my third curcumin amplifier. Galangal: "The gold mine of future therapeutics." Just like ginger, galangal warms the body and aids in digestion. It’s also a powerful anti-nausea remedy. Since it doesn’t have the same recognition as either curcumin or ginger, it hasn’t been studied so extensively. It was not until the 800s AD that galangal found its way into European hands through spice trade with the East. A cure-all for many conditions that ravaged Europe at the time. In fact, amidst the Bubonic Plague that destroyed a third of Europe’s population, people created potential life-saving medicines. Medicines that included galangal due to its antimicrobial properties. One of the most famous legends was that of the “Four Thieves” — four men who went around sacking the homes of plague victims, but never contracted the plague. Their immunity was credited to the “Four Thieves Oil” they designed, which included galangal. That’s just a few reasons why I’ve made galangal one of the key ingredients of my new breakthrough. Again, I call it Curcumin Triple Burn. In all my years on the cutting edge of natural health, I’ve never seen a curcumin formula like it. None that include a therapeutic dose of curcuminoids… delivery technology proven to enhance its absorption by 2,000%… or spices that complement and amplify curcumin’s healing potential. I’ve added one more extra “kicker” to boost this formula’s results. And just as the name sounds, it adapts to what your body needs, at any given moment. Need sleep? Energy? Stamina? Stress relief? These herbs are so smart, and so powerful, they deliver it you. And the effects last all day long. Adaptogens recently started gaining ground in America, but in India, Russia and China they’ve been a staple form of medicine for thousands of years. Holy Basil: The Wonder Herb. Over 25 herbs are classified as adaptogens. One in particular is being recognized as a leader in Ayurvedic medicine. And I’ve made this “smart herb” the platoon leader of my curcumin formula. This herb harnesses their full healing potential… commands exactly where they target… and keeps them disciplined, working all throughout the day, in any situation, for whatever your body needs. And it’s revered as an “elixir of life” without equal in its healing powers, which are now being confirmed by modern science. Another group of researchers call it an “herb for all reasons.” 43 And it’s not hard to see why. Tulsi – just like other adaptogens – is proven to balance serum levels of cortisol.44 And that’s no small matter. The so-called “stress hormone” is proven to wreak havoc on your mind and body. You see, it was previously thought cortisol overload simply broke down our immune system… causing colds. According to groundbreaking new research at Carnegie Mellon University, high levels of cortisol – caused by chronic stress – decrease the sensitivity of our immune cells to hormone signaling. This triggers the immune system’s cytokine cells to release a non-stop inflammatory response. Perhaps that’s why stress has been implicated in just about every health concern imaginable. And why Holy Basil – a proven cortisol regulator – is proven to work on so many age-related conditions. Half of the patients were given 2.5 g of holy basil leaf powder daily, and the other half were given a placebo for four weeks. Compared to the control group, the group administered holy basil experienced some amazing results. Not only did fasting glucose and post-meal glucose reach normal healthy levels. They saw enhanced support for healthy cholesterol levels during the treatment as well! In another study, holy basil extract (500 mg twice daily) enhanced mood in unhappy middle-aged adults. And it’s a powerful brain booster, too – much like curcumin. This is the final ingredient in my new curcumin breakthrough formula: Curcumin Triple Burn. It seems like every day the new science shows its healing potential is second to none. There’s almost nothing it can’t do for your body… no result it can’t deliver… and no health concern it doesn’t address. But to make it even more affordable, and accessible to YOU. As you may know, I’ve referred to curcumin as the $1 pill. And that’s certainly true, at least for most formulas. I’m going to stand by my $1 reference with an incredible introductory offer, as you’ll see in a moment. But first, I have to admit. There’s one catch. The $1 pill is here! At this moment, I only have a shipment of 243 bottles on hand. Which means only a handful of people are going to get these first orders at this low price. Once this shipment runs out, I can’t guarantee that I can still offer it for $1 per pill. After all, this is not your ordinary curcumin. And even at $2, with all of the health concerns it solves, many would consider it a bargain. Not only that, I’ve sent this message to over 200,000 people today, which means less than 1% will get a shot to claim their spot. In order to guarantee shipments for my VIP Auto Delivery members, we may have to shut down this presentation in the next few days… possibly even tonight. That’s why—if you do get the opportunity to claim your supply—I urge you to take advantage of our discount on multi-bottle orders. I mean, it’s 100% guaranteed or your money back, so why mess around? When you order right now, you’ll get a free membership in my VIP Auto Delivery Service, which means you don’t have to worry about re-ordering. Just when your initial order is about to run out, our system will alert us and we’ll securely re-charge your card to rush you a fresh supply of Curcumin Triple Burn. You can cancel your delivery or change the schedule at any time, for any reason. Auto Delivery is simply the only way we can guarantee you the best price and a steady supply. And I think you’ll really love it—because it saves you the hassles of reordering—and it entitles you to FREE shipping for as long as you remain a member. Yep—as an Auto Delivery VIP, you won’t pay a cent for shipping… ever. So once you try Curcumin Triple Burn and love it—you don’t have to lift a finger to keep getting it. Of course, it’s your call. And you have plenty of time to try it. 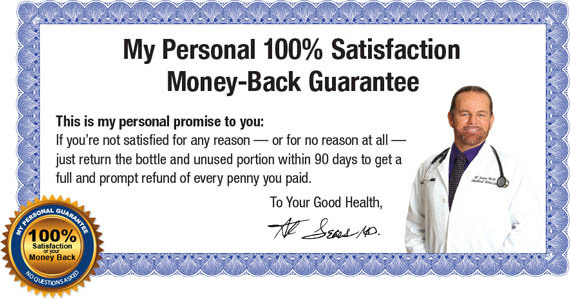 At any time in the next 90 days, for any reason—just send your current bottle back, and we’ll send you a refund of every penny of the purchase price. So there’s really nothing to think over—you don’t even have to decide anything right now. Just try it! Just say the word and get your money back. It’s simple: if it doesn’t work for you, you don’t pay for it. Well, today — if you select the three-month, Auto Delivery option — you can lock in this curcumin breakthrough for just $1 a day. That’s just 50 cents per pill! And I recommend you do so, because once you begin experience the real potential of curcumin… looking and feeling many years younger and healthier…. You’ll only have one concern left…. The option is a no-brainer. So please, don’t delay. I really want you to take advantage of my offer right now. I want you to start feeling younger brain power, energy and vitality. So don’t wait any longer. Click the Order Button below NOW. I’ll save 30% by joining the Curcumin Triple Burn 3-month Auto Delivery Program,which includes a locked-in discount and FREE Shipping for Life. 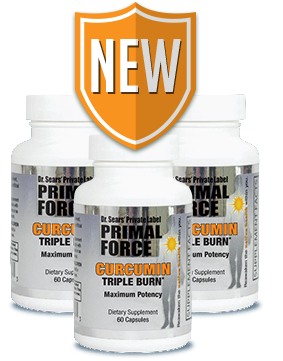 I’ll get 3 bottles of Curcumin Triple Burn shipped right to my door every 3 months for just $29.95 each for a total of $89.85. And I will get this discounted price along with FREE shipping for as long as I take Curcumin Triple Burn. For my convenience, my credit card will be automatically charged with each shipment. I’ll never have to worry about reordering and I can cancel at any time! That’s an annual savings of over $263! 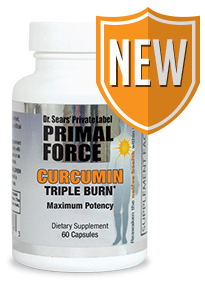 I’ll get 3 bottles of Curcumin Triple Burn shipped right to my door for only $38.65 each, PLUS shipping and handling. I'll get 1 bottle of Curcumin Triple Burn for $42.95 PLUS shipping and handling. Dr. Sears takes a fresh, novel approach to patient health and wellness. Our environment has changed for the worse — and it’s affecting your health. He helps patients escape accelerated aging caused by modern toxins, chemicals and other hormonal threats you unknowingly face every day. Every year, he travels over 20,000 miles to the most remote regions of the world searching for natural healing secrets unknown or ignored by mainstream medicine. 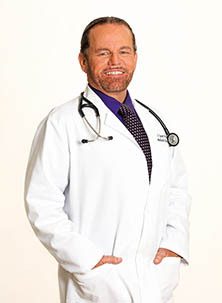 Since 1999, Dr. Sears has published 35 books and reports on health and wellness. He has millions of loyal readers spread over 163 countries. Today he writes and publishes two monthly e-Newsletters, Confidential Cures and Anti-Aging Confidential for Women, and a daily email broadcast, Doctor’s House Call, with more than 500,000 subscribers. He has also appeared on more than 50 national radio programs, ABC News, CNN and ESPN. Dr. Sears was one of the first to be board-certified by the American Academy of Anti-Aging Medicine (A4M). More than 25,000 patients travel from all around the world to visit him at the Sears Institute for Anti-Aging Medicine in beautiful Royal Palm Beach, Florida. Recently, Dr. Sears proved you can affect the way you age by controlling the length of your telomeres. He made history as the first MD to introduce the Nobel prize-winning, anti-aging breakthrough of our time, telomere DNA therapy, to the general public. And now he’s working with the leading scientists in the field of telomere biology to further define how this incredible technology will shape the future of anti-aging medicine. 2 Chuengsamarn S, et al. Curcumin extract for prevention of type 2 diabetes. Diabetes Care. 2012 Nov ;35(11):2121-7. 3 Akazawa N, et al. Curcumin ingestion and exercise training improve vascular endothelial function in postmenopausal women. Nutr Res. 2012 Oct ;32(10):795-9. 4 Yang YS. Lipid-lowering effects of curcumin in patients with metabolic syndrome: a randomized, double-blind, placebo-controlled trial. Phytother Res 2014 Dec;28(12):1770-7. 6 Belcaro G, et al. Efficacy and safety of Meriva®, a curcumin-phosphatidylcholine complex, during extended administration in osteoarthritis patients. Alternative Medicine Review 2010 Dec;15(4):337-44. 7 Thring et al. 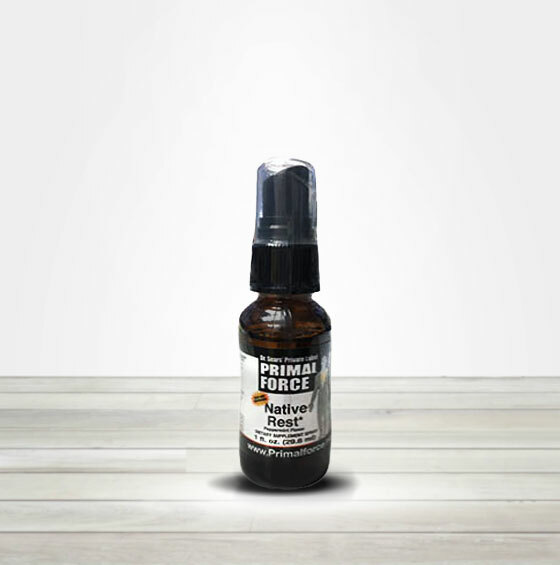 Anti-collagenase, anti-elastase and anti-oxidant activities of extracts from 21 plants. BMC Complement Altern Med 2009, 9:27 doi:10.1186/1472-6882-9-27. 9 McFarlin BK, Venable AS, Henning AL, Best Sampson JN, Pennel K, Vingren JL, Hill DW. Reduced inflammatory and muscle damage biomarkers following oral supplementation with bioavailable curcumin. BBA Clinical 2016; 5:72-78. 10 Lal B, Kapoor AK, Asthana OP. Efficacy of curcumin in the management of chronic anterior uveitis. Phytother Res. 1999 Jun;13(4):318-22. 11 Xiao Z, Zhang A, Lin J, Zheng Z, Shi X, Di W, et al. (2014) Telomerase: A Target for Therapeutic Effects of Curcumin and a Curcumin Derivative in Aβ1-42 Insult In Vitro. PLoS ONE 9(7). 12 “Curcumin May Prevent Clogged Arteries.” WebMd.com, 20 July 2009. 13 Khajehdehi P. Oral supplementation of turmeric decreases proteinuria, hematuria, and systolic blood pressure in patients suffering from relapsing or refractory lupus nephritis: a randomized and placebo-controlled study. J Ren Nutr. 2012 Jan;22(1):50-7. 14 Wanwarang W, et al. Effects of curcuminoids on frequency of acute myocardial infarction after coronary artery bypass grafting. Am J Cardiol. 2012 Jul 1 ;110(1):40-4. 15 Shin SK, HA TY, McGregor RA, Choi MS. Long-term curcumin administration protects against atherosclerosis via hepatic regulation of lipoprotein cholesterol metabolism. Mol Nutr Food Res. 2011 Nov 7. 17 Zaahkouk AMS, et al, “Efficacy of a novel water-soluble curcumin derivative versus sildenafil citrate in mediating erectile function,” International Journal Of Impotence Research, vol. 27, no. 1, pp. 9–15, 2015. 18 Lal B et al. Efficacy of curcumin in the management of chronic anterior uveitis. Phytother Res 1999 Jun;13(4):318-22. 19 Sanmukhani J, et al. Efficacy and Safety of Curcumin in Major Depressive Disorder: A Randomized Controlled Trial. Phytother Res. 2013 Jul 6. 20 Kim, T., Davis, J., Zhang, A.J., He, X., and Mathews, S.T. (2009) Curcumin activates AMPK and suppresses gluconeogenic gene expression in hepatoma cells. Biophys. Res. Commun. 388, 377–382. 21 Shoba G, et al. Influence of piperine on the pharmacokinetics of curcumin in animals and human volunteers. Planta Med. 1998 May;64(4):353-6. 22 Tu, Y, et al. 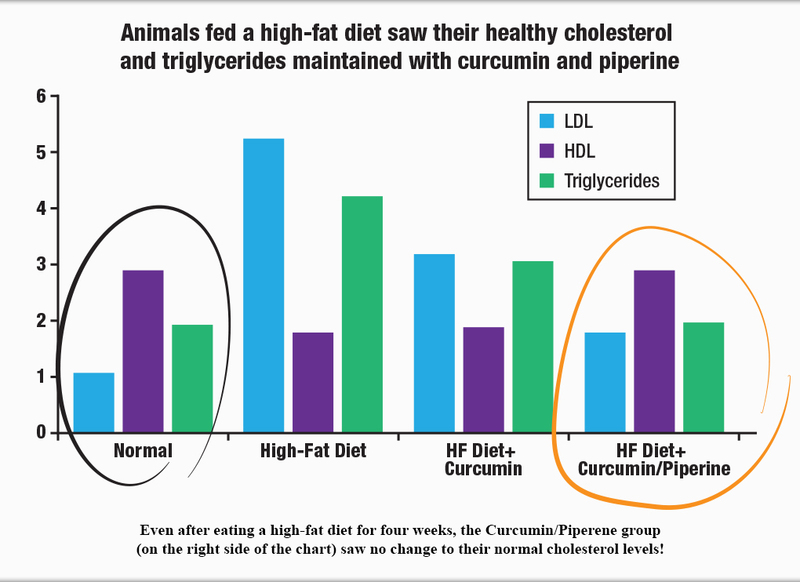 Piperine potentiates the hypocholesterolemic effect of curcumin in rats fed on a high fat diet. Exp Ther Med. 2014 Jul;8(1):260-266. 23 Bhutani MK, et al. Anti-depressant like effect of curcumin and its combination with piperine in unpredictable chronic stress-induced behavioral, biochemical and neurochemical changes. Pharmacol Biochem Behav. 2009 Mar;92(1):39-43. 24 Kaur G, et al. Influence of Piperine and Quercetin on Antidiabetic Potential of Curcumin. J Complement Integr Med. 2016 Jun 25. 25 Panahi Y, et al. Effects of Curcuminoids-Piperine Combination on Systemic Oxidative Stress, Clinical Symptoms and Quality of Life in Subjects with Chronic Pulmonary Complications Due to Sulfur Mustard: A Randomized Controlled Trial. J Diet Suppl. 2016;13(1):93-105. 26 Singh S, et al. Piperine Enhances the Protective Effect of Curcumin Against 3-NP Induced Neurotoxicity: Possible Neurotransmitters Modulation Mechanism. Neurochem Res. 2015 Aug;40(8):1758-66. 27 Sehgal A, et al. Combined effects of curcumin and piperine in ameliorating benzo(a)pyrene induced DNA damage. Food Chem Toxicol. 2011 Nov;49(11):3002-6. 28 Ryan JL, et al. Ginger (Zingiber officinale) reduces acute chemotherapy-induced nausea: a URCC CCOP study of 576 patients. Support Care Cancer. 2012 Jul;20(7):1479-89. 29 Mansour MS, et al. Ginger consumption enhances the thermic effect of food and promotes feelings of satiety without affecting metabolic and hormonal parameters in overweight men: a pilot study. Metabolism. 2012 Oct;61(10):1347-52. 30 Altman RD, et al. Effects of a ginger extract on knee pain in patients with osteoarthritis. Arthritis Rheum. 2001 Nov;44(11):2531-8. 31 Akinyemi AJ, et al. Dietary Supplementation of Ginger and Turmeric Rhizomes Modulates Platelets Ectonucleotidase and Adenosine Deaminase Activities in Normotensive and Hypertensive Rats. Phytother Res. 2016 Jul;30(7):1156-63. 32 Tahereh A, et al. The effect of ginger consumption on glycemic status, lipid profile and some inflammatory markers in patients with type 2 diabetes mellitus. Int J Food Sci Nutr. 2014. 35 Lawrence T. The nuclear factor NF-kappaB pathway in inflammation. Cold Spring Harb Perspect Biol. 2009 Dec;1(6). 36 Lee HY, et al. 1-Dehydro--gingerdione from ginger inhibits IKKβ activity for NF-κB activation and suppresses NF-κB-regulated expression of inflammatory genes. Br J Pharmacol. 2012 Sep;167(1):128-40. 37 Naderi Z, et al. Effect of ginger powder supplementation on nitric oxide and C-reactive protein in elderly knee osteoarthritis patients: A 12-week double-blind randomized placebo-controlled clinical trial. J Tradit Complement Med. 2015 Jan 28;6(3):199-203. 38 Altman RD, et al. Effects of a ginger extract on knee pain in patients with osteoarthritis. Arthritis Rheum. 2001 Nov;44(11):2531–8. 39 “Health Benefits of Ginger.” Arthritis Today Magazine, 22 Jan. 2016. 40 Altman RD, et al. Effects of a ginger extract on knee pain in patients with osteoarthritis. Arthritis Rheum. 2001 Nov;44(11):2531–8. 41 Ghosh, S. Alpinia: the gold mine of future therapeutics. 3 Biotech. 2013 Jun; 3(3): 173–185. 43 Cohen MM, et al. Tulsi – Ocimum sanctum: A herb for all reasons. J Ayurveda Integr Med. 2014 Oct-Dec; 5(4): 251–259. 44 Jothie Richard E, Illuri R, Bethapudi B, et al. Anti-stress activity of Ocimum sanctum: Possible effects on hypothalamic-pituitary-adrenal axis. Phytother Res. 2016;30(5):805-14. 45 “Cortisol: Why the Stress Hormone is Public Enemy No. 1.” Psychology Today, 22 Jan. 2013. 47 Agrawal P, et al. Randomized placebo-controlled, single blind trial of holy basil leaves in patients with noninsulin-dependent diabetes mellitus. Int J Clin Pharmacol Ther. 1996 Sep;34(9):406-9. 48 Bhattacharyya D, Sur TK, Jana U, et al. Controlled programmed trial of Ocimum sanctum leaf on generalized anxiety disorders. Nepal Med Coll J. 2008;10(3):176-9. 49 Sampath S, Mahapatra SC, Padhi MM, et al. Holy basil (Ocimum sanctum Linn.) leaf extract enhances specific cognitive parameters in healthy adult volunteers: A placebo controlled study. Indian J Physiol Pharmacol. 2015;59(1):69-77. Copyright 2017, Al Sears M.D. All Rights Reserved.